Nickname: Just Ivory. Some people may tend to call her Ivy, which she hates. Looks: Short for her age, Ivory enjoys bugging others about their height. She treats the Thomas brothers, although one's a finder, as elder brothers and friends. She has short, shaggy brown hair and blueish-purple eyes. She absolutely loves the exorcist clothing so she wears it when she can. She has no exact preference for clothing other than the exorcist clothing. If she can't wear it, she usually dresses up in black and green. She is Russian so her appearance may look a bit harsh and her voice is also pretty gravelly. Personality:Ivory is hyper, paranoid, and brave seemingly all at one time. Although she may seem quick to run, once Ivory sets her mind on something, she will never give up. She's also very persistent on getting what she wants. She absolutely hates to kill but will if the need arises. She sees other people in the Order a long lost siblings, or family she never knew. She respects some people better than others. Description: The inscription on this necklace has two wolves, one chasing the sun, the other chasing the moon. Description:Ivory gains dark gray energy claws. Her eyes get a slight redish glow and her familiar changes form. The familiar's referred to as Hati in this form. Description:Ivory gains silver energy claws. Her eyes get a slight more blueish glow and her familiar changes form. The familiar's referred to as Skoll in this form. Past: The innocence that Ivory refers to as Wolf Pendant was given to her by her dead friend. She had no idea it was innocence until an exorcist/finder team came to get her and take her to the Asian branch. She hadn't always noticed the familiar standing next to her. She slowly began to notice that they resembled the wolves on the necklace.
. She grew up for 5 years with a bunch of kids known as the "Assault Brigade" or "Shturmovaya brigada" in her native speech. Her littlee group consisted mostly of boys her age who had similar problems. There was one other girl, who became Ivory's best friend in the first 3 years. 1 year later, the girl disappeared, and so had some of the boys. The girl came back covered in blood. "Valentina!" Ivory came to her friend's side. "What the heck?" Valentina had changed, her eyes seemed dull, her hair matted. Not to mention her blood stained clothing. Slowly, Valentina died. Day by day, the girl grew weaker. Hour by hour, her breathing a little shallower. Valentina called Ivory to her. "My dear friend..." She put a hand on Ivory's shoulder. She put her other hand in front of Ivory. When she opened her hand, there lay a necklace, a pendant. 2 wolves, One chasing the moon, the other chasing the sun. 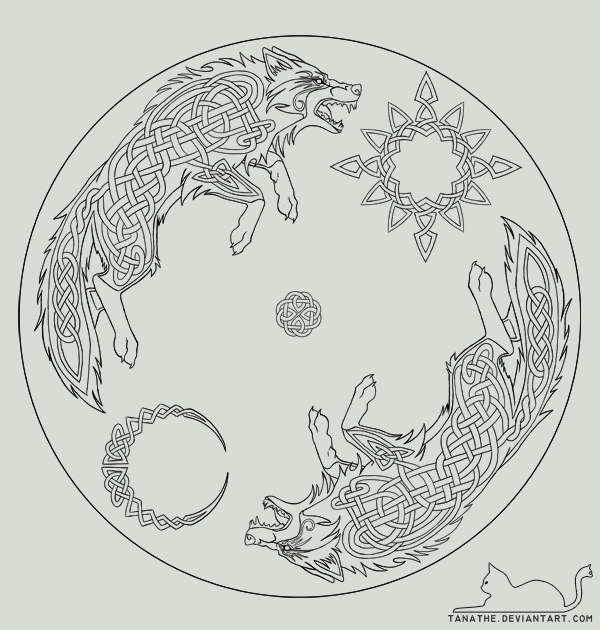 "Skoll and Hati..." Ivory mused, knowing the Norse Mythology. "My dear friend..." Valintina coughed, laying up against a building, "Veryu." Believe. Ivory took it to heart. When Valentina died, Ivory took good care of the necklace. Ivory never realized that she was starting to control her 'powers.' She never even realized them until one day, when she was trying to outrun some older street thugs. They chased her around until finally they got her cornered. Ivory couldn't run now and she was weak from hunger and the loss of Valentina. She curled up into a ball and let them kick her, beat her, whack her. Ivory barely heard the growling from not that far away. The growl suddenly became louder as the boys retreated. Ivory looked up. A silver wolf crouched over her. It stopped growling and looked at her. Ivory still didn't notice that it was weird. This was the second time the familiar had saved her. The first time it had been Hati, not Skoll, who had saved her. On her 13th birthday, Ivory was found by a finder and exorcist team by the name of the Thomas Twins. They took her to the Asian Branch where she is now. RolePlaying Sample: Ivory walked through the hallways of the Black Priest's Asian Branch. The hair stood on end and her face had bruises. Her eyes were dull and she seemed not to care at all for the world. "I hate explosives..." Ivory whined to herself. She brought her hand up to grasp her pendant. Skoll appeared next to her, Yes Ivory? Ivory jumped, "Mind not doing that, Skoll?" Ivory continued to walk forward and accidentally bumped into someone. She feel backwards and looked up, "Sorry..."